Villa Cempaka is one of five private villa residences that make up the Puri Tirta Estate located on the water’s edge of Bali’s Benoa Harbour, just 900 metres from the main road of the Tanjung peninsula near Nusa Dua. Charming and very comfortable the villa has all the ingredients necessary for a fantastic holiday. Villa Cempaka Comprise three bedrooms which is the master bedroom is positioned on the upper floor and accessed via an external staircase. The two guest rooms are situated on ground level and each is accessed via glass sliding doors, which open directly to the pool. Villa Cempaka is included all modern conveniences including a home theatre TV entertainment system, a well equipped kitchen, swimming pool, comfortable soft furnishings, sun loungers by the pool, a seven-seat luxury car, a rooftop relaxation lounge with views of the water and all attended by professional and attentive staff. 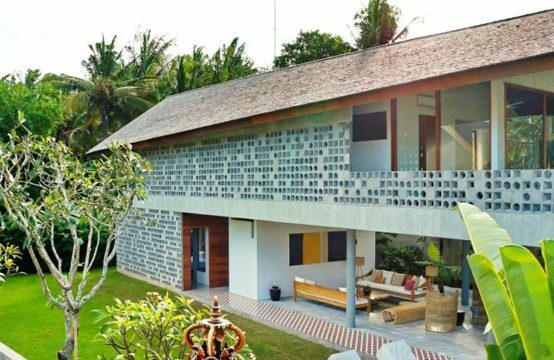 And all these in a location second to none on the edge of Bali’s Benoa Harbour and a five-minute drive from the white sand beaches and five star resorts of Nusa Dua in your personal chauffeured seven-seater family mini-van. The master bedroom is positioned on the upper floor and accessed via an external staircase. The two guest rooms are situated on ground level and each is accessed via glass sliding doors, which open directly to the pool. The master features a king-size bed, air-conditioning, a ceiling fan and a 40-inch satellite channel TV. Guest bedroom one features a queen-size bed, air-conditioning ceiling fan and 32-inch satellite channel TV. The en-suite bathroom with marble flooring also features twin vanities, fitted wardrobes, and an outdoor open-air shower. The second guest bedroom is similar in style, but with a high roof and a queen size four-poster bed. 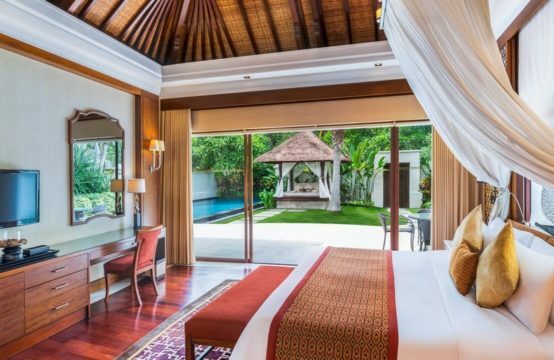 Villa Cempaka is part of the Puri Tirta Estate, comprising four private villas the Estate is located on Benoa Harbour, Tanjung peninsula near Nusa Dua. The villa features all the creature comforts that guests may desire including a home theatre TV entertainment system, a well equipped kitchen, swimming pool, comfortable soft furnishings, sun loungers by the pool, a seven-seat car with a driver and a roof-top relaxation lounge with views of the water. The living room is air conditioned with ceiling fans, a well equipped kitchen, lounge area with comfortable sofas, cable TV and DVD, stereo sysytem, a pool side terrace with sun loungers and rattan furniture. The swimming pool offers an inviting setting with it’s bale and outdoor table setting. A pier housing a private boat, which can take you to explore the nearby beaches, the authentic fisherman’s town on Serangan ‘Turtle’ Island, or even on fishing and snorkeling expeditions.